A pack of wolves rest in their den, tired and hungry the winter has been cruel to them. Outside is the wilderness, cruel and relentless but filled with memories of times they have shared. At deaths door they need to have a successful hunt to get through the rest of winter. Nostrils widen, ears twitch and hairs bristle on the back of their necks. The scent of prey is in the air, all or nothing, they make their way out of the den. Earlier this month I attended the Nineworld’s (@London_Geekfest) Convention in London. It was a fantastic event filled with really interesting talks and activities, it was also a incredibly friendly and considerate place to be. At the event, I attended a Roleplay Game Jam which was run by Ben Meredith (@BenRLMeredith) and Tom Hatfield (@WordMercenary). 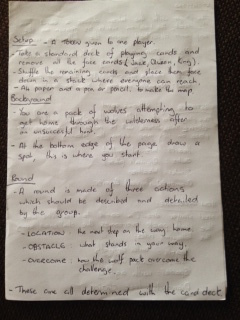 Each participant was given two words/concepts and asked to make a roleplay game in the theme of wilderness. The two concepts I got to work with were Blizzard and Wild Animals. With the approximately two hours we were given I was quite pleased with what I developed. Here are the original hand written notes. I’ve only had chance to write up the notes fully, and in doing so I have made a few changes. So instead of the wolves finding their way home, they are adventuring out. I changed the location card variables to follow heart, club, spade, diamond to keep them in keeping with the other two parts. There were a couple of other minor changes and I tried to improve the explanations in the rules to make them clearer. Finally I settled on the title and added a little pre-ramble to set the scene. 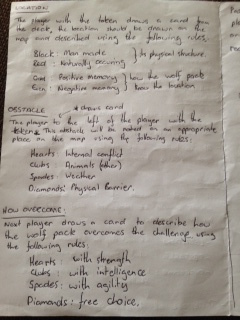 This entry was posted in Practice, RPG and tagged final chase of winters wolves, Game Jam, nineworlds on August 27, 2015 by davidpeterking.